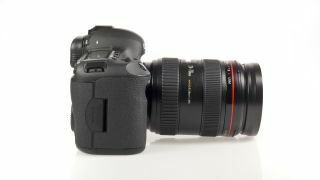 Lenses designed especially for video would be "good to have"
A spokesperson for Canon UK has said that the company is looking into the possibility of power zoom DSLR lenses, designed for video use. Speaking to TechRadar, David Parry from Canon UK said "Power zoom would be very good to have for video, we're looking into it - that would be quite intriguing." Although primarily used for shooting stills, Canon's DSLRs, most notably the 5D Mark II, have gained a reputation for video use, being used not only by consumers but also in Hollywood and TV production. Power zoom lenses negate the need for the ring to be twisted, which introduces camera shake and noise when recording video. Other possibilities when using electronically powered zoom lenses could be to program the lens to behave in a certain way, for instance zooming in or out after a given period of time. There are currently no power zoom lenses for DSLRs available on the market, however both Panasonic and Olympus produce such models for their compact system cameras. The standard kit lens which comes packaged with the Olympus OM-D includes the option to switch between a conventional rotating ring design and a power zoom. Canon currently produces standalone video cameras alongside its traditional "stills" cameras, so it perhaps has an advantage over some other manufacturers as it could bring across technologies from that arena.